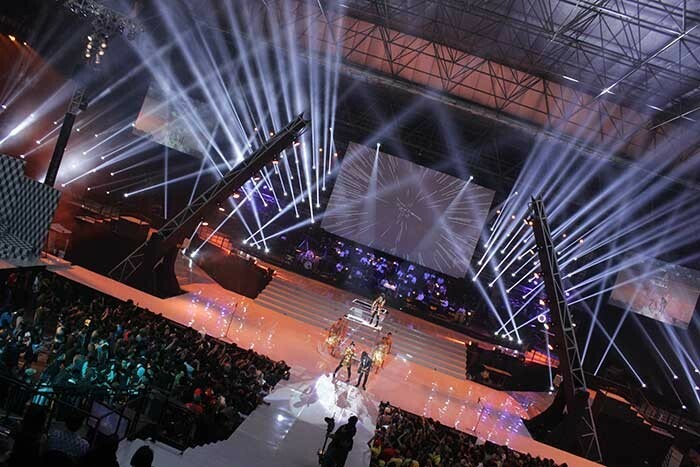 Indonesia - Major Indonesian creative event management company, Focus Productions, has been working together with PR Lighting for the past three years, and during that time it has built up a massive inventory of around 400 discharge and LED fixtures, making it one of the Chinese manufacturer’s biggest customers. With offices in both Jakarta and Bali, Focus specialises in providing all types of lighting, video (including LED screens), audio and staging — to an international standard. Among their own customers is the huge MNC Group, the country’s biggest media conglomerate, which includes RCTI TV, Global TV, MNC TV, and other wholly-owned subsidiaries, supporting their broadcast events, both outdoor and indoor. Recently they supplied MNC Group with the production services to enable Global TV to celebrate its 11th anniversary, including 80 PR Lighting XR 200 Beam. The show consisted mostly of outside broadcast live music with all 80 heads mounted on the overhead truss. For the TV show the PR Lighting fixtures fulfilled the requirement for a powerful beam effect. This fully-featured moving head is equipped with the Platinum 5R moving beam light which offers unprecedented brightness usually only achieved with far greater wattages. Weighing just 16kg, produces a perfectly parallel, laser-like beam with an incredible output of 67,765 lux at 20m. And with its light weight and compact footprint, it can easily be accommodated in large multiples on trusses at live and TV events such as this.